A global non-profit organization the World Toilet Organization declared November 19 to be World Toilet Day. Celebration of this unusual holiday draws public attention to the problems of sanitation around the world and helps improve it. The World Toilet Organization (WTO) was founded by Jack Sim in 2001. At first this organization included only 15 members, but very soon it expanded to 151 member organizations in 53 countries around the world. Back in 2001 WTO proclaimed the day of its foundation to be World Toilet Day and since then it's annually observed. Estimated every third person has no toilet, lack of sanitation leads to development of enteric infections. 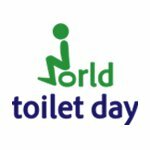 Taking this into consideration, the Untied Nations General Assembly recognized World Toilet Day in 2013 and urged all member states organize appropriate activities. Recognition of this holiday on the international level contributes to a better awareness on different aspects of use of sanitation for all. Various events are held on this day, including cash awards to inspected public toilets and giving them a 5-star rating.